The sprawling frame of Archaeopteryx is one of the most widely-recognized images from the world of paleontology, yet fewer than a dozen specimens of the iconic "first bird" have been unearthed since the the species was first discovered in 1861. 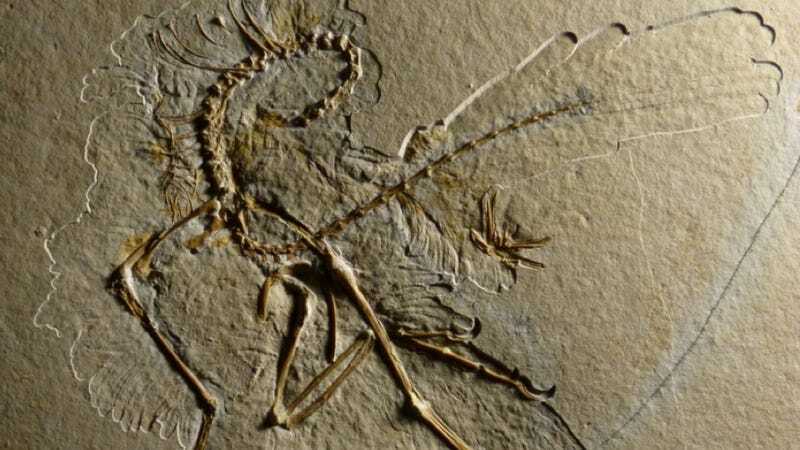 But yesterday, researchers announced the discovery of a brand new Archaeopteryx specimen — and it's a stunning one at that; the fossil appears to be one of the most complete and well-preserved examples of the 150-million-year-old dinosaur we've seen (save for the fact that the skeleton is missing a head), and even includes some very clear impressions of feathers (click on the image below for a better look). Archaeopteryx is one of the world's most iconic prehistoric animals - a dinosaur caught in the midst of evolving into a bird, some 155 million years ago. In German it's the urvogel, loosely translated as the original bird, as it was, until recently, believed to be the earliest bird species. This new fossil, complete except for its head, is only the eleventh Archaeopteryx skeleton ever discovered. Like every other, it was found in Germany. The first was a single feather, recognised 150 years ago, just two years after Darwin published On the Origin of Species. The bones and feathers are nearly as well preserved as those of the famed Berlin specimen, says the Oliver Rauhut, curator of the Bavarian State Collection for Palaeontology and Geology. Some specimens are only partial, including one that palaeontologists have called the "chicken wing". The fossil will be on display from October 28—30th at the Munich Mineral Show, the largest event of its kind in Europe. The show tends to attract a lot of attention from fossil-lovers, which might explain why we've been seeing some pretty big announcements from the world of paleontology in the last few days; just last week researchers announced the discovery of one of the most well-preserved dinosaur skeletons the world has ever seen. This specimen will also be on display at the Munich Mineral show, beginning on the 27th.